*blows dust off disused blog* Hello? Anyone there? 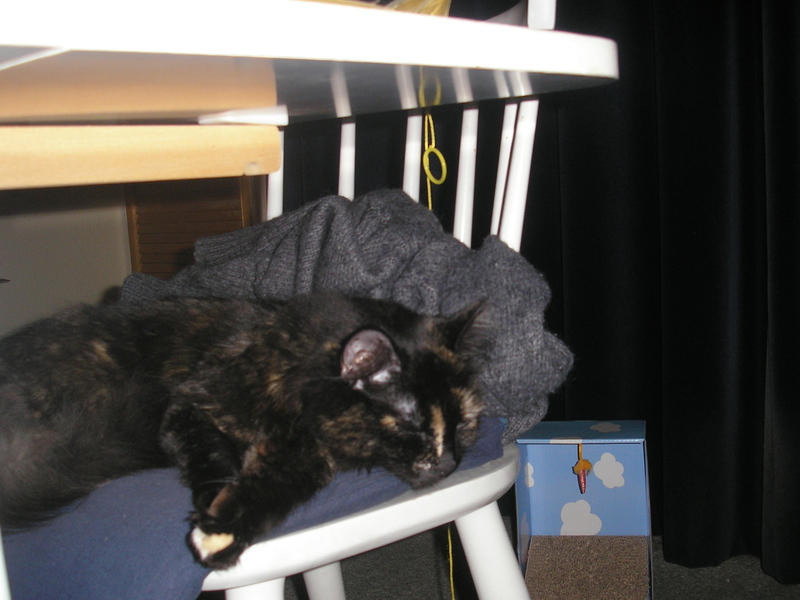 As you can see my lazy human hasn’t done ANYTHING with this blog since my last purrthday. Looks like I am only allowed to blog once a year! Hissssss! She does put pictures of me on Facebook though. Anyway, I am here and still looking gorgeous and full of tortitude, and today is my FOURTH PURRTHDAY!!! We have all been getting on with our lives here in London. My garden is looking good and I still enjoy playing in it. I have snoopervised the redecoration of the human bedroom and study. We had some sadness a few months ago when DC ran off to the Bridge. 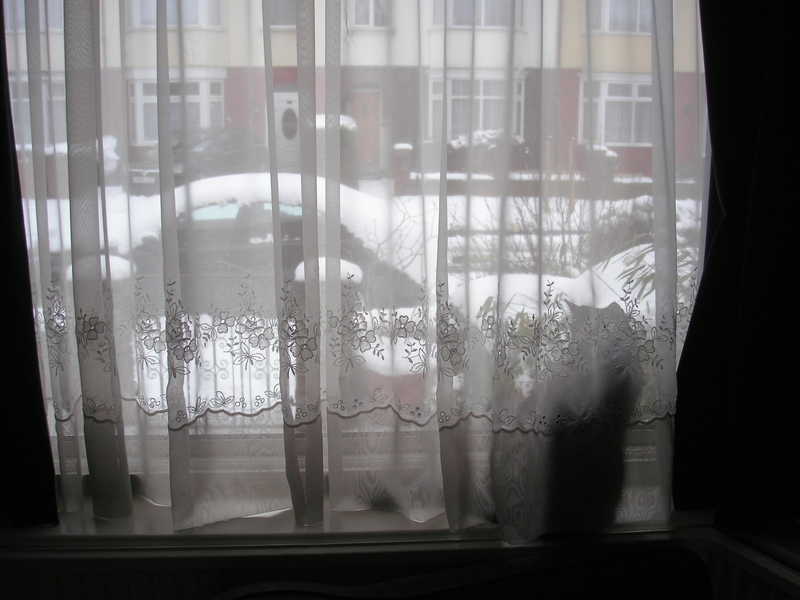 He never wanted to play with me – he only wanted to eat and sleep – but we do miss him. There is this Evil Stripy Cat who hangs around all the time in my garden now. He is a bit of a sad case really. I hiss at him and bop him on the head to keep him in his place. The humans have started feeding him. Typical. I had TUNA for my purrthday breakfast this morning and then I opened the BOX OF PRESENTS I got from my boyfriendcat, Ducky. Look at all the lovely things he sent me! 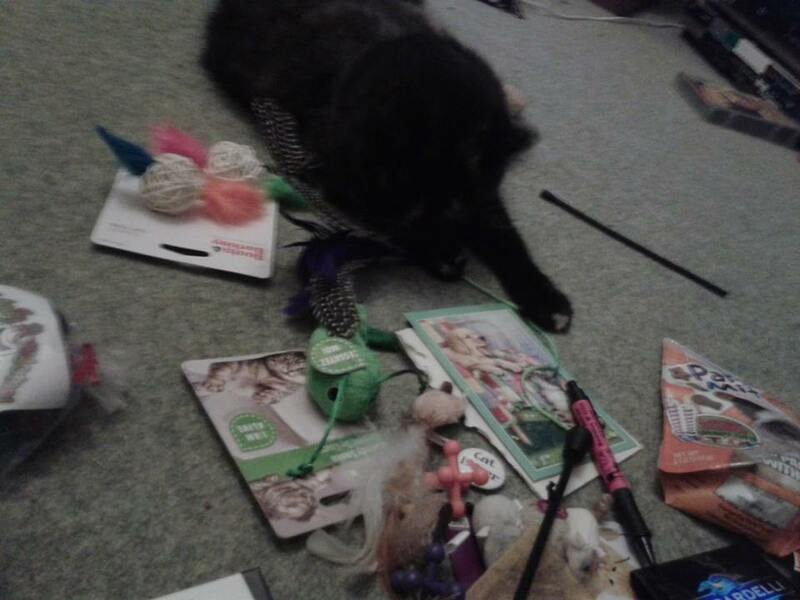 My human says I am a spoilt kitty. 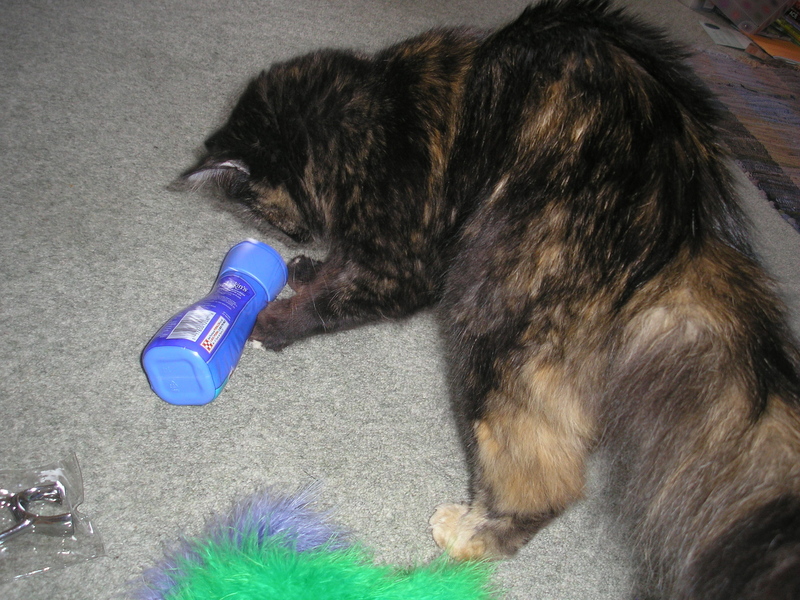 I went straight for the feathers and dragged them out of the box – can you see the feathers? There are no excuses good enough for the laziness of my human when it comes to blogging on here, but at least she puts pictures of me and DC on Facebook sometimes. Anyway, it is my purrthday again and I am THREE! Hard to believe I know, especially when I still run around like my tail is on fire or like a mad kitten (that’s what the humans say anyway). Today is the first day of my mum’s long summer holiday from teaching sticky little people. So she had no excuse for not doing a purrthday post for me. 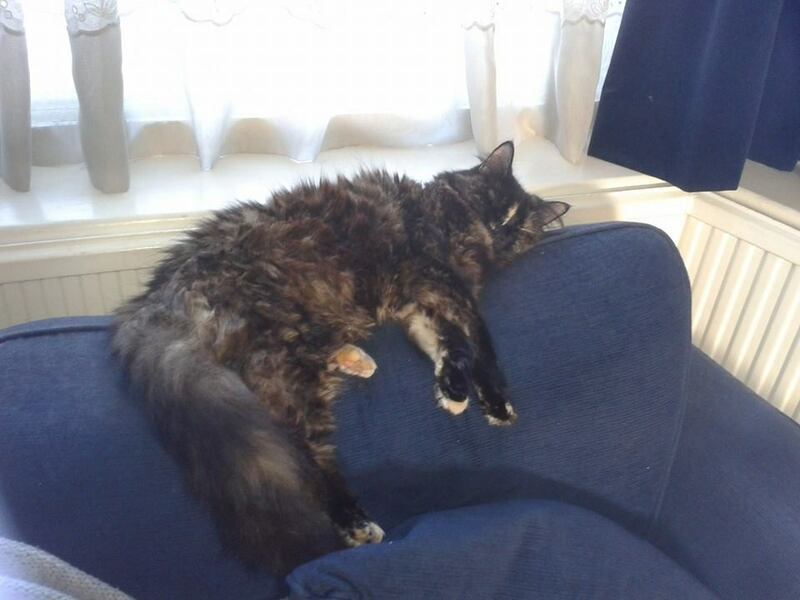 We are all fine here, it has been pretty hot in London lately, we have had the hottest weather here for 7 years, which is tough if you have a floofy fur coat. 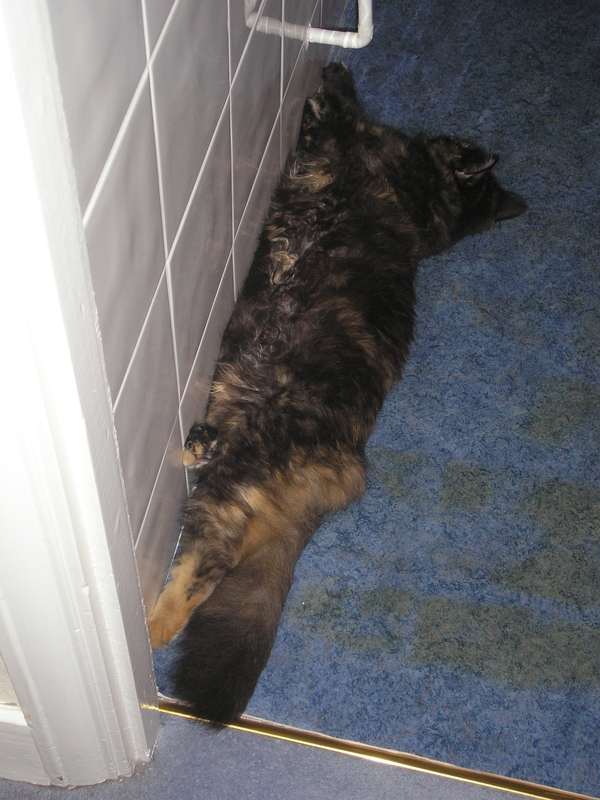 I have been lying against the tiles in the bathroom trying to keep my cool. 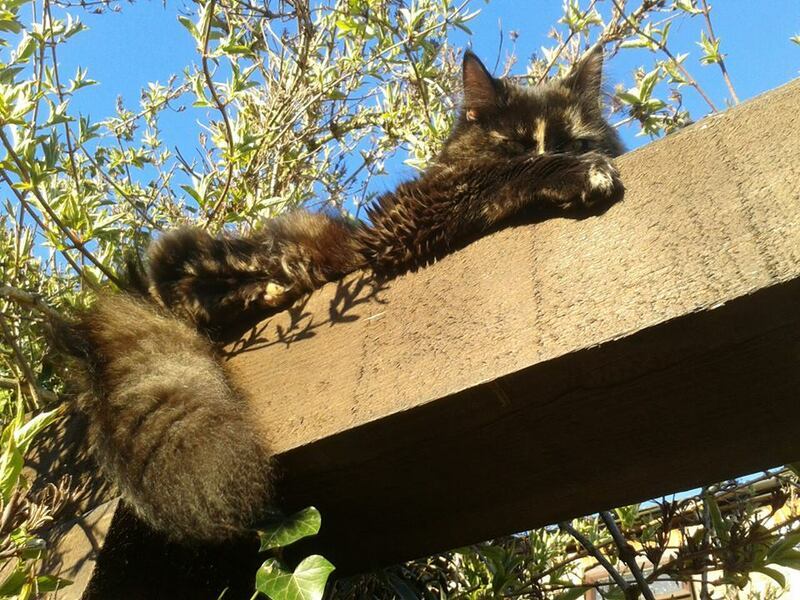 But sometimes it is nice to sunbathe on top of the pergola where you can watch everything. I have particularly been enjoying chasing butterflies in the garden, I haven’t managed to catch one yet but we do have lots of butterflies in this hot weather. There is also a frog who has come to join the newts in our pond. Leo, the next door ginger cat, and I have spent hours in the evenings trying to lean into the pond to catch Mr. Froggie, but so far he has managed to evade us by diving under the water, which I think is unfair. 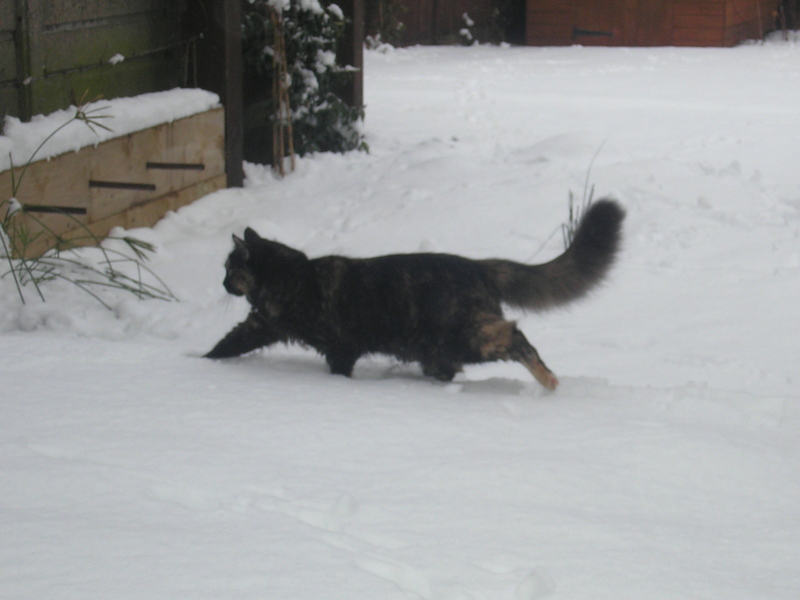 I am off to celebrate my purrthday with a special treat of tuna in spring water – YUM! 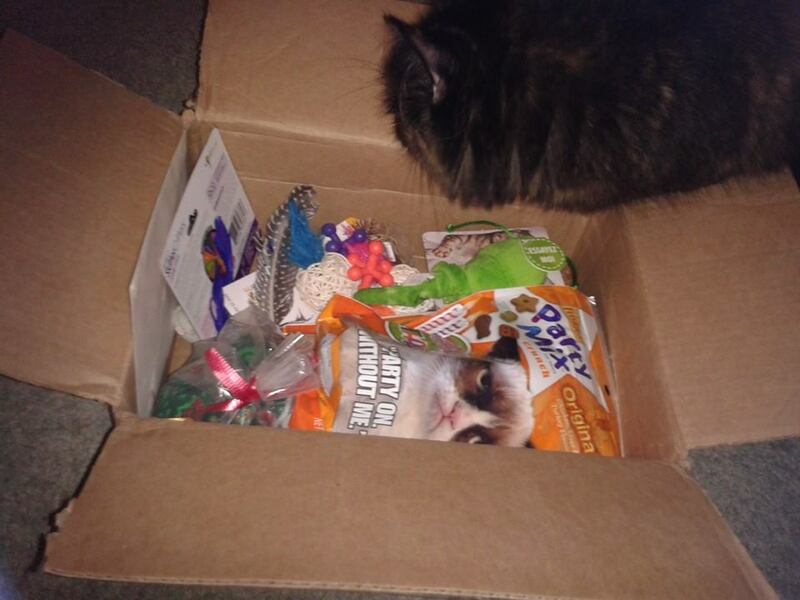 – and open the exciting box I have received from my boyfriendcat, Ducky. Happy purrthday to me, and I will try to get my useless human to update some time in the fairly near future! My human has been spectacularly bad at updating this blog this year, mostly because she is on Facebook all the time when she is claiming she is too busy to help me blog. But I just had to insist on being allowed to wish all my friends a Happy Christmas, in case they don’t read my mum’s Facebook. And if you don’t read my mum’s Facebook (see link on the right) , you won’t even know about…D.C.!!! He is kind of boring. I keep trying to get him to play with me but he is rude and ignores me – all he wants to do is eat and sleep and occasionally get totally stoned out of his kitty brain on catnip. Oh. And sometimes he does really stinky things in the litter box. No one asked me if I wanted to have a stinky boy cat around but we don’t hiss at each other. I have some of my meals on the counter now though because if my food is on the floor Someone Else hoovers it up. He is not skinny any more. In fact my mum says he is really heavy! He purrs louder than me but he does not run fast or jump high like me. Tomorrow the humans and I are going on a very long car journey to Devon Grandma’s. I am not that keen on going in the car but I will like seeing Devon Grandma. Maybe she will play with me. D.C. doesn’t have to go in the car. He is going to stay here and sleep and get fed by Uncle Andrew and be boring. Happy Christmas to all my friends. I will try to make my human make a New Year’s Resolution to help me blog much better in 2013! Today is my second Gotcha Day. 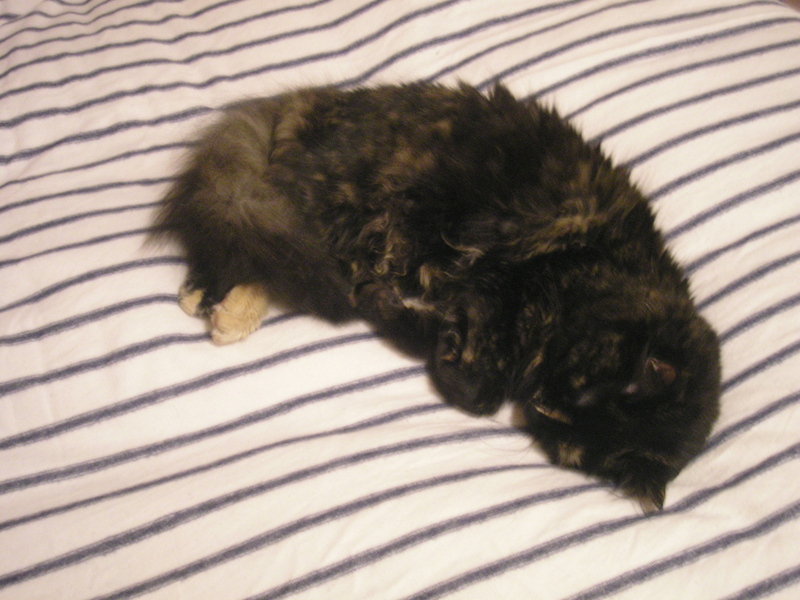 When I was a little tiny kitten I lived with the people next door and some other cats (including Leo the ginger), but when I was only 10 weeks old they decided they didn’t want me any more because they “couldn’t cope with so many kids and cats”. So I moved one house to live with my humans, who had a vacancy for a cat-in-charge because the late great Fat Eric had gone to the Bridge. 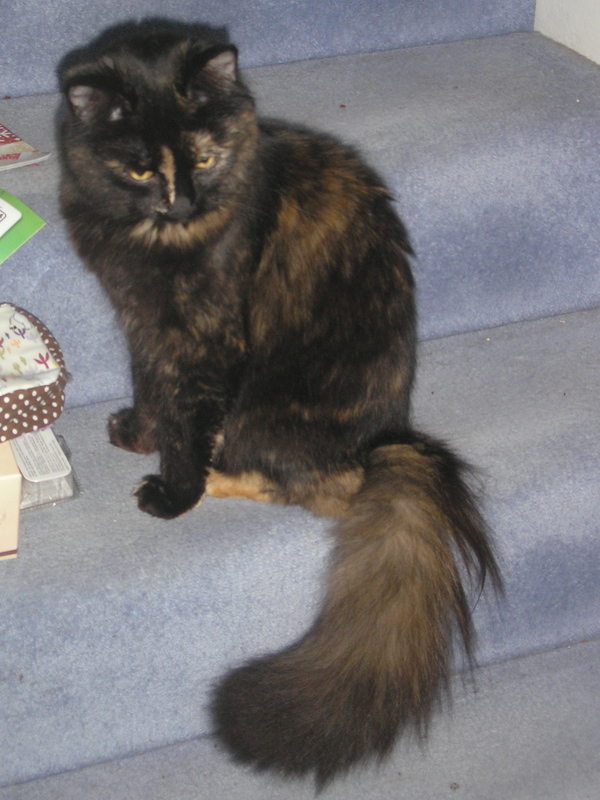 Here I am on my Gotcha Day, sitting on the stairs about an hour after I arrived, checking out the house. Being in charge of a whole house and two humans when you are very small is a big challenge! 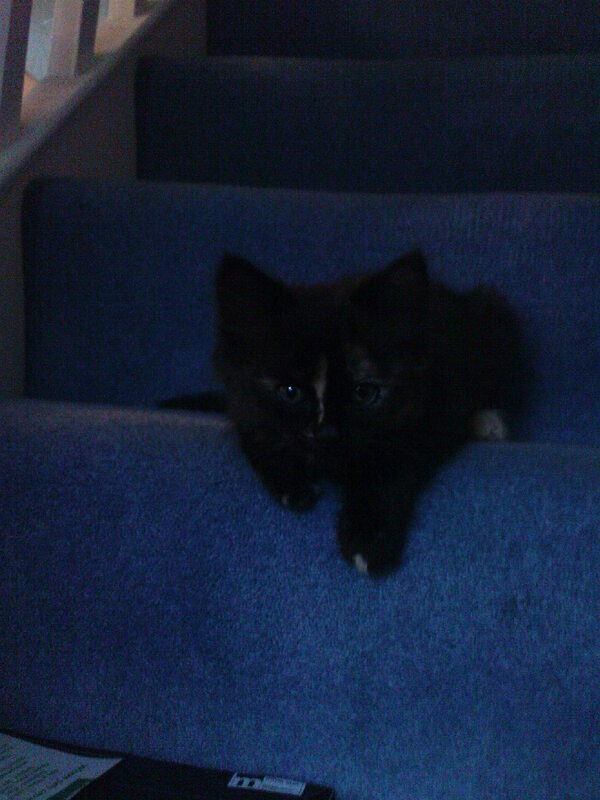 And here I am on the same stairs, all grown-up and Queen of the house! I’m BAAAAAACK! And it’s my PURRTHDAY! 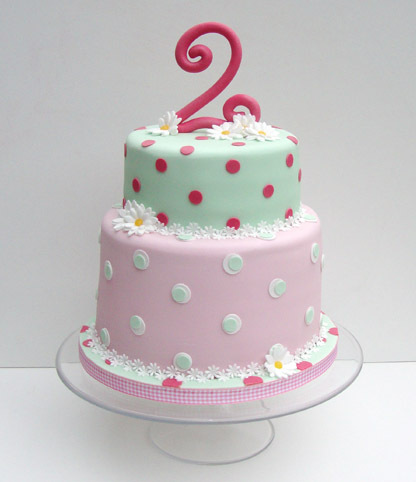 I am TWO!!! Can you believe that my Useless Human hasn’t helped me blog since FEBRUARY???? Disgraceful! Especially when I have had so many fun adventures since then, and I haven’t been allowed to visit lots of my bloggy friends either. But now my human is on her long school summer holidays and so she can’t use the excuse about being too busy and I told her she HAS to let me blog today because it’s my PURRTHDAY! I am two whole years old! 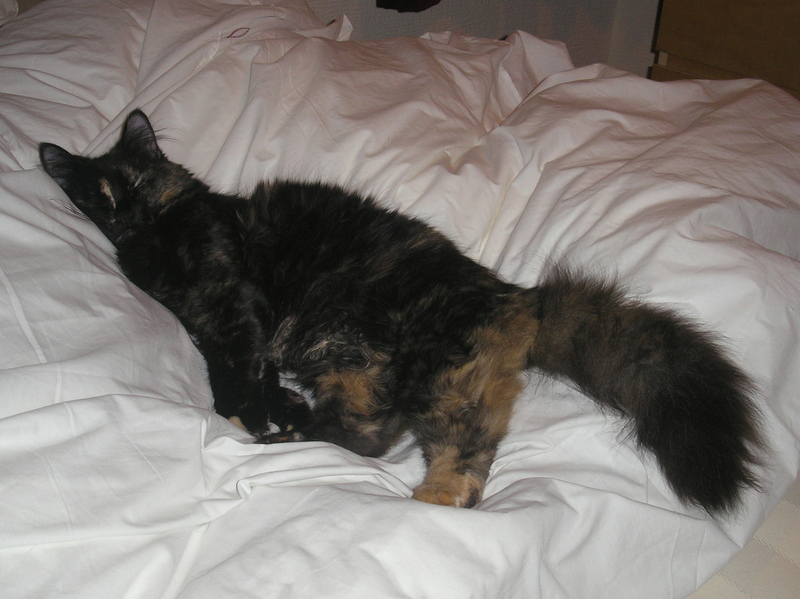 As you can see, I am still floofy and gorgeous and full of tortie attitude. 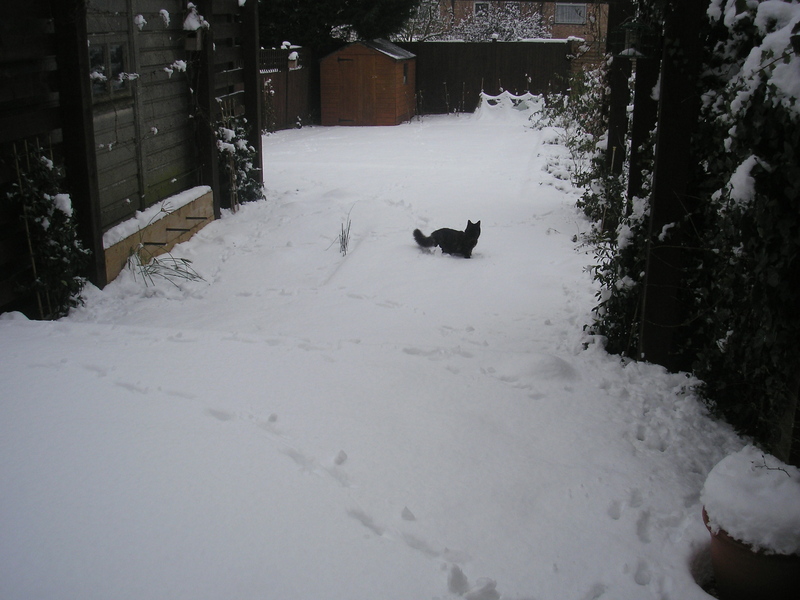 Here I am in my garden. 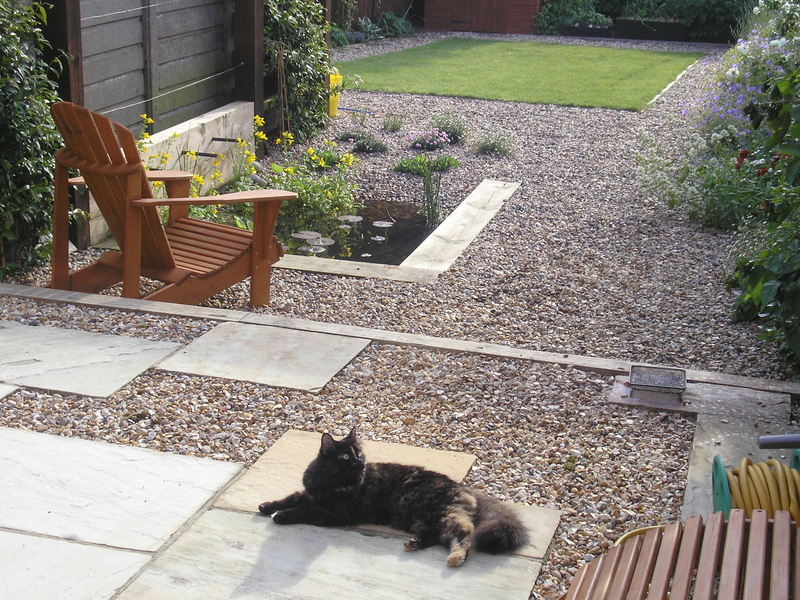 We have had lots and lots of rain this “summer” but now for the last few days it has been sunny and warm so I have been spending a lot of time playing in my garden. Often I play with my friends Leo and D.C. (Well, I play with Leo, D.C. is a bit old and dignified for playing with us). I will post some pictures of them now that I am allowed to blog again. 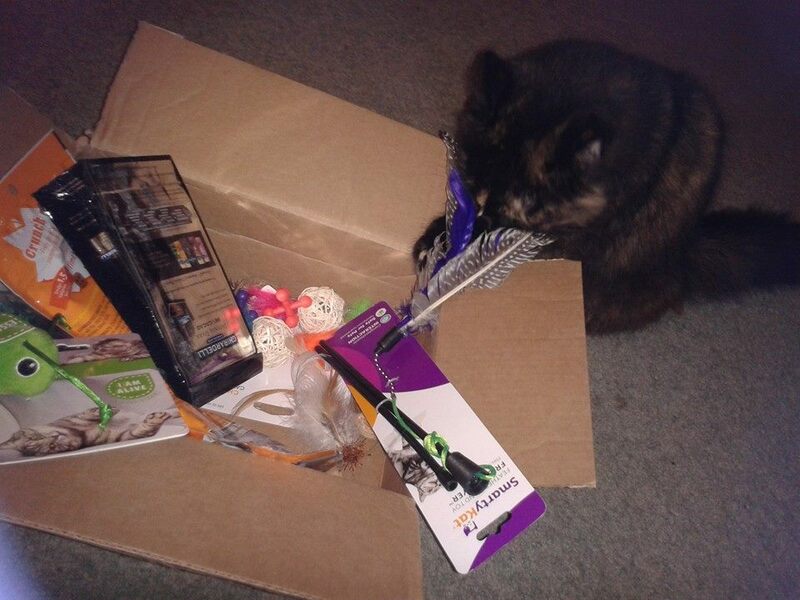 My humans bought me some really cool presents for my purrthday. I had a scratching post and I kind of destroyed it so I was hoping my humans would buy me a new scratching post, but they bought me something even BETTER! Look! I have lots more pictures of me on my new kitty climbing tower to share later. 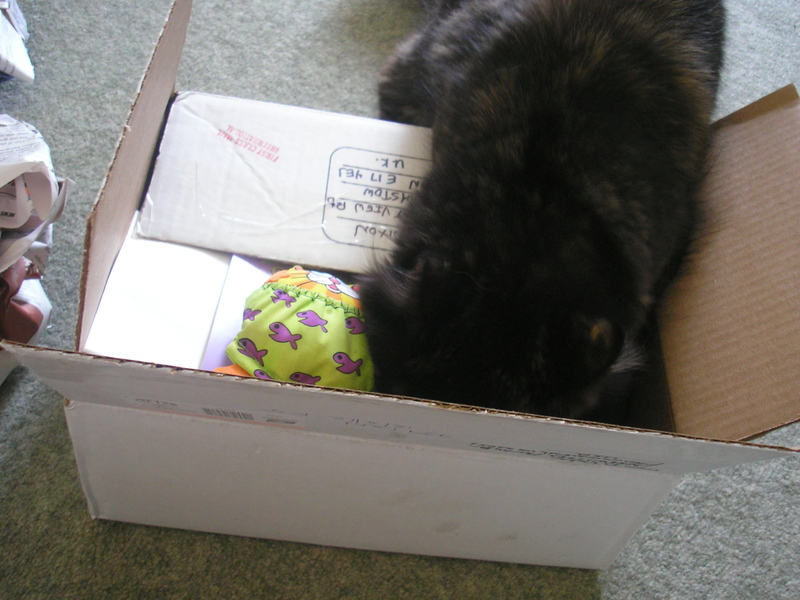 To make my purrthday even better, yesterday I got a parcel all the way from Mericky! 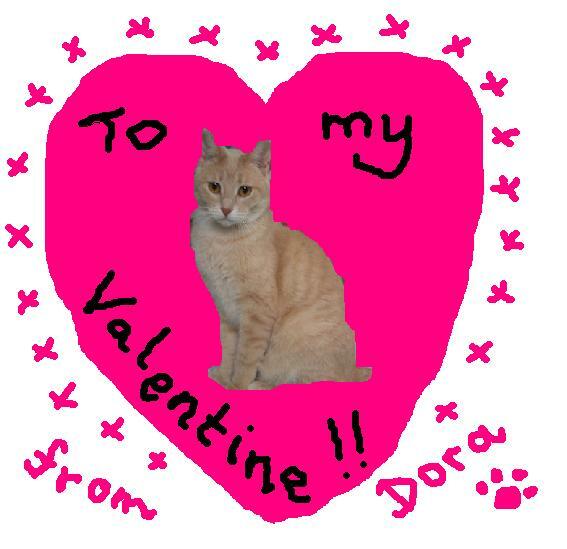 It was from my boyfriendcat, Ducky! He is such a thoughtful boyfriendcat. 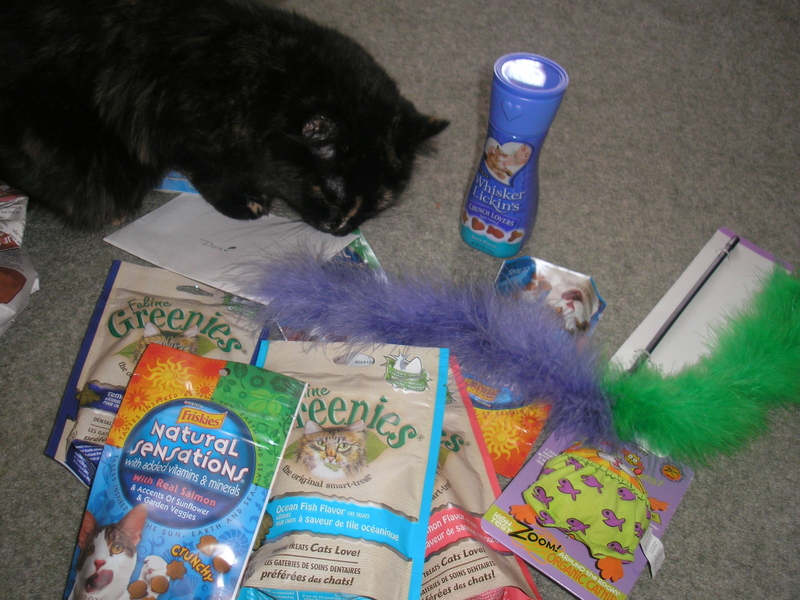 He sent me a whole box of toys and treats, and also a beautiful hummingbird card. 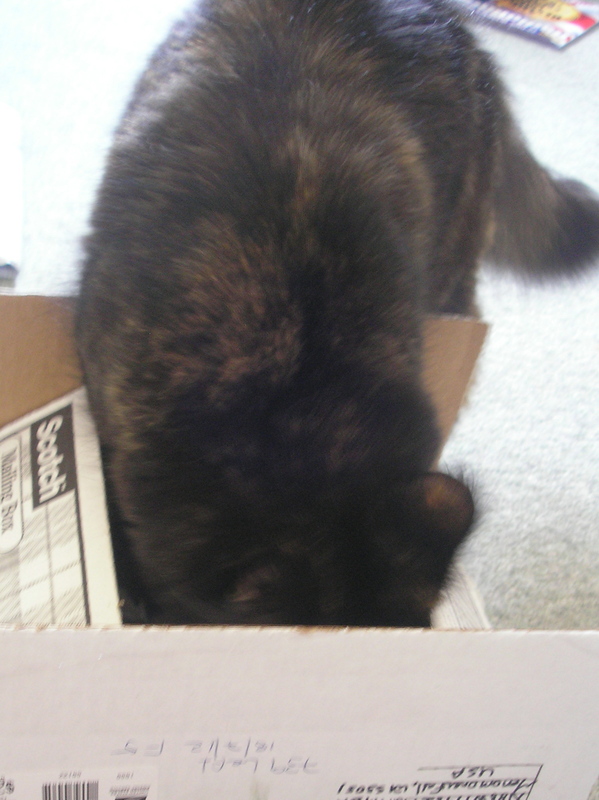 Here I am unpacking the box. So far my favourite items are the catnip mouse toy and the tub of treats you can roll around (my mum left the room for 5 minutes and I worked out how to remove the lid from the tub all by myself, hee hee!) 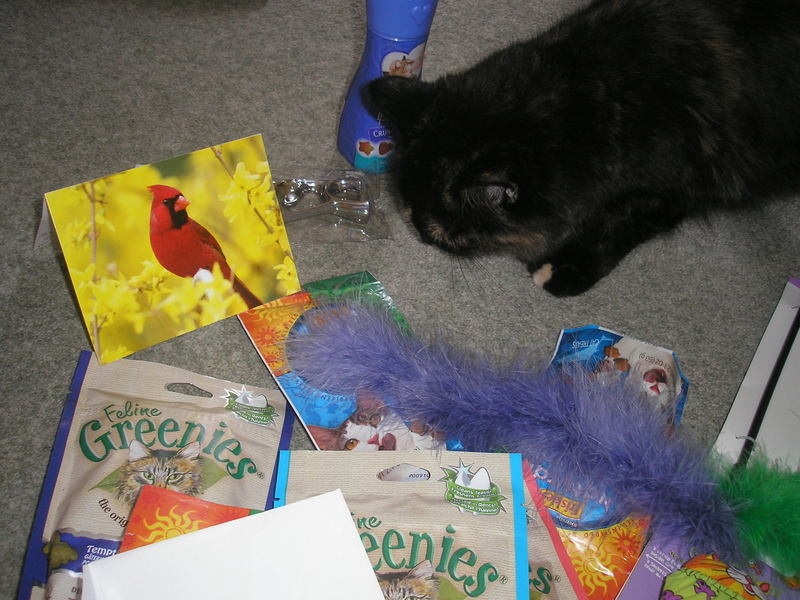 THANK YOU SO MUCH FOR MY PRESENTS, DUCKY! 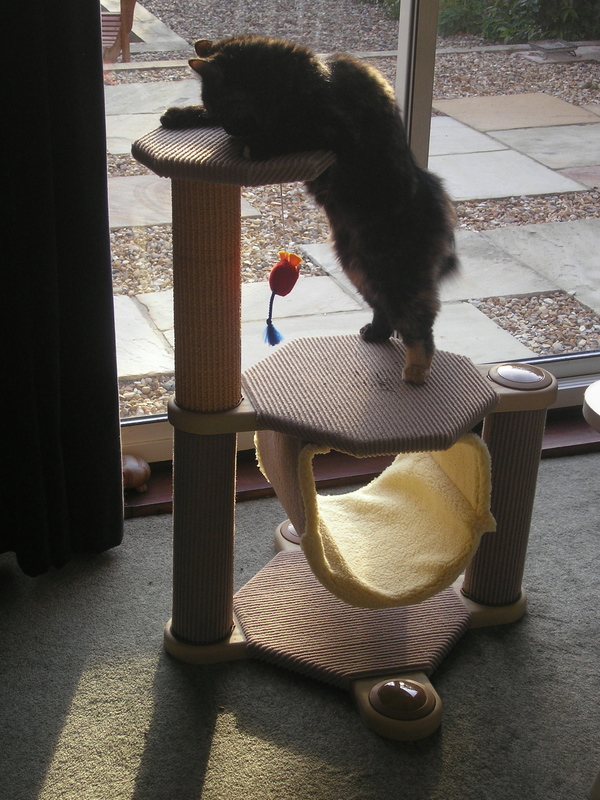 Everyone come over and share my toys and treats – I’ll even let you climb on my new climbing tower! Happy purrthday to me! I made this Valentine especially for my favourite mancat. I hope he likes it! 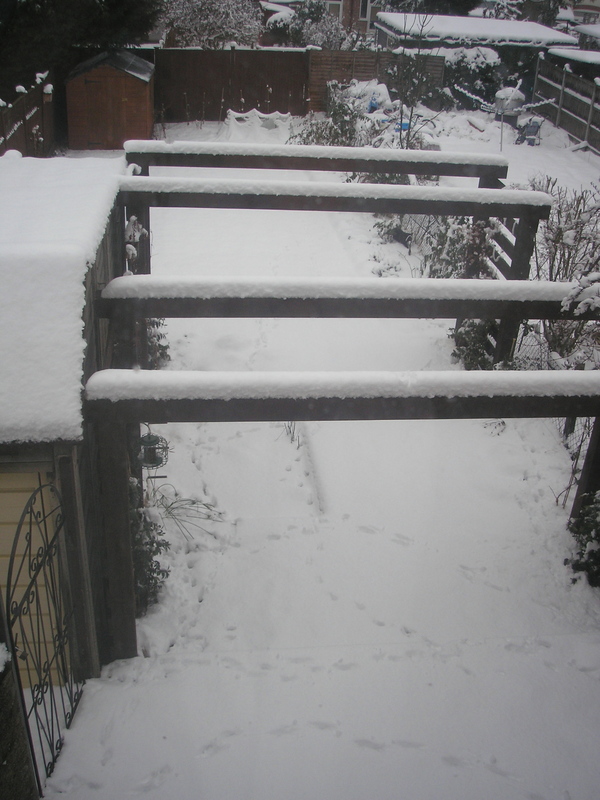 Look what happened to my garden, kitties! Where is my pond? Where is the green grass?? What is all this white stuff?? ?